When you lose a loved one, often a special memorial is critical to healing. Miscarriage - loss of your precious baby - should be validated and held close to your heart. Still births and loss after birth are devastating. 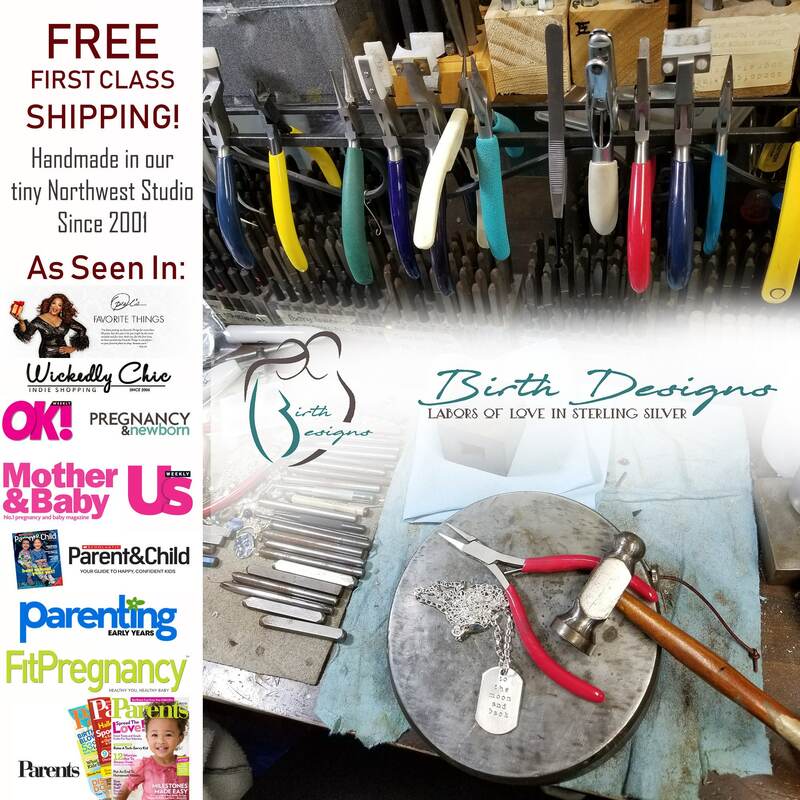 Here, we offer respectful and beautiful memorial jewelry, loss jewelry, miscarriage jewelry and baby remembrance jewelry. Our unique "Actual Hand and Footprint" series is a copyrighted exclusive. We are honored to share in both your joy and your mourning. 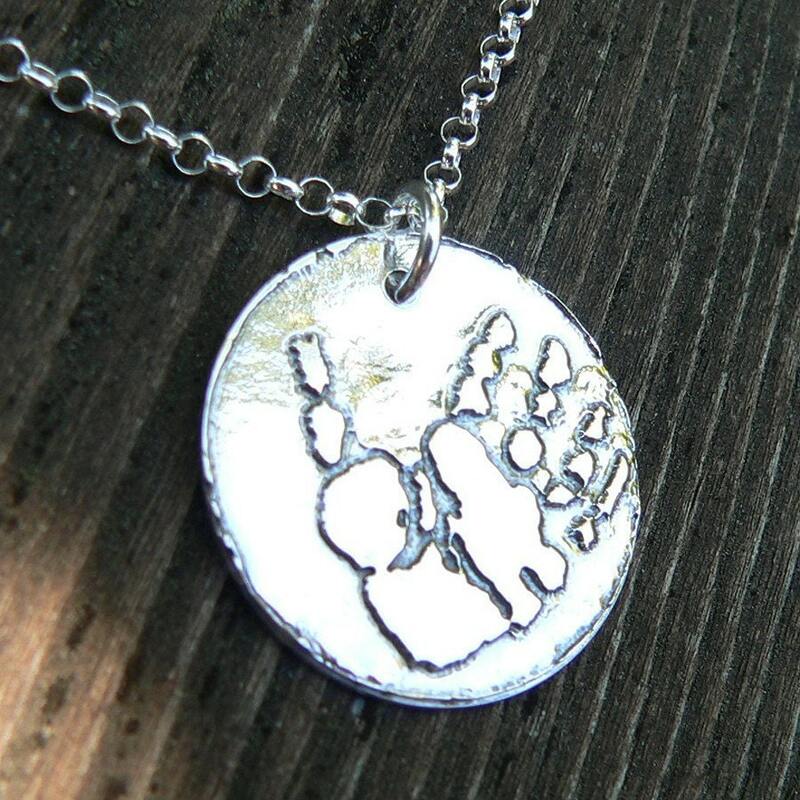 This piece can be made with your child's *actual* handprint or footprint (if you have one) or I can use a representative print. I will take the image, shrink it down, and etch it into sterling silver (or solid copper - see our other listings). Your choice of words and symbols on the opposite side (you can get an idea of fonts and what would fit from the photos) in solid sterling silver. The sterling silver coins are then soldered together to make one fantastic piece. The total size of the pendant is about 1" diameter and 2mm thick. Suspended from a sterling silver chain - your choice of length up to 20". If no length is indicated, a 16" necklace with 2" extender will be sent. ♥ To order your necklace, just buy this item, then leave your with your desired font & phrase in the comments. Then, I will provide you with an email address to send a file or a snail mail address to send an actual copy of your child's hand/footprint. If you have any questions at all, just convo us! I will send you a file that shows about what it will look like on the metal. Remember, it will not show detail like ink will, but it will be an actual representation of your child's hand. ♥ This item is hand-stamped, and the letters will not be perfectly straight - it's part of the charm of this artisan item :) Additionally, stamping is a much deeper impression, and also blackened, to be much more visible than traditional engraving. It will last longer, and will not "rub off" like some engraving. We have other hand-stamped items available in our store, if you would like to see more examples. 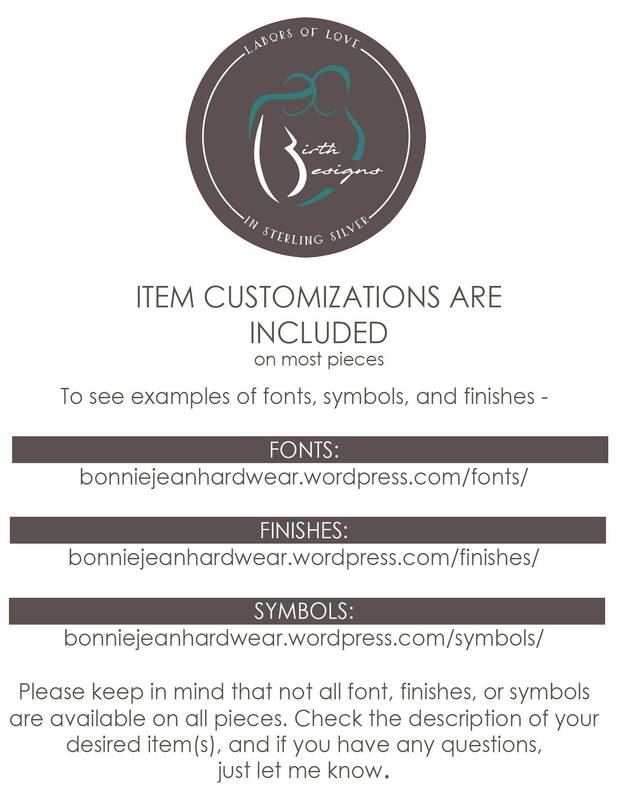 ♥♥ Please see our profile for a list of custom stamps available for your creation! 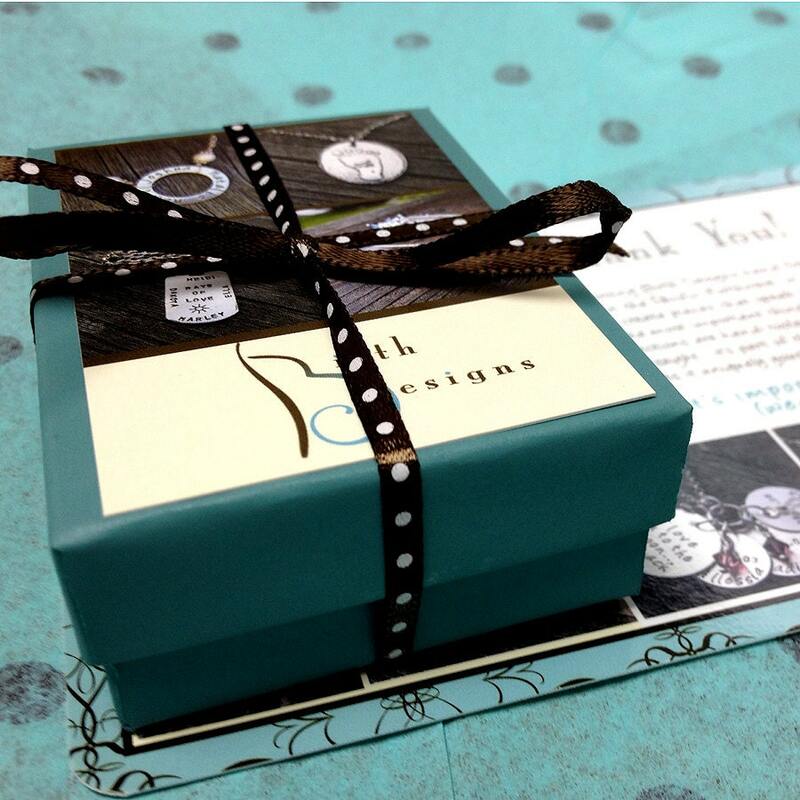 ♥ All orders are packaged in our custom and professional Birth Designs cocoa-and-turquoise boxes. They include an information card about Birth Designs. ♥ We are happy to include matching gift cards at no extra charge if requested. 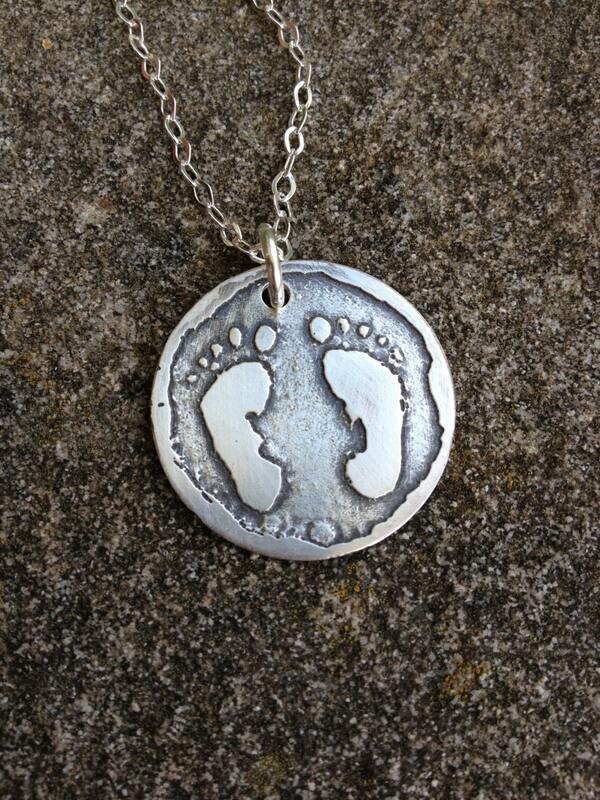 ♥ This particular item will ship about 1-2 WEEKS from when the hand/footprint is received. This is a very labor intensive piece. All effort will be made to ship sooner, but it may be up to four weeks before shipping. ♥ *all orders* ship USPS Mail unless requested otherwise.